Happy Wednesday dear friends!! 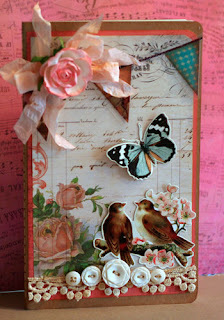 I am excited to share some fun and easy gifts using Glitz Design Paper Layers today! I don't know about you, but I am always needing a quick gift for a friend and I never seem to have that special something on hand. Well, today, we are going to take care of that problem and you will always have a special homemade gift right within reach! I layered some Glitz Design "Love Games" Poppies patterned paper on top of the journal and added a slightly smaller Glitz Design "Laced with Grace paper layer on top. 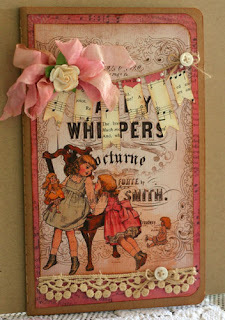 Then I embellished with lace, buttons, vintage ephemera, Afternoon Muse Peekaboo, florals and ribbon. 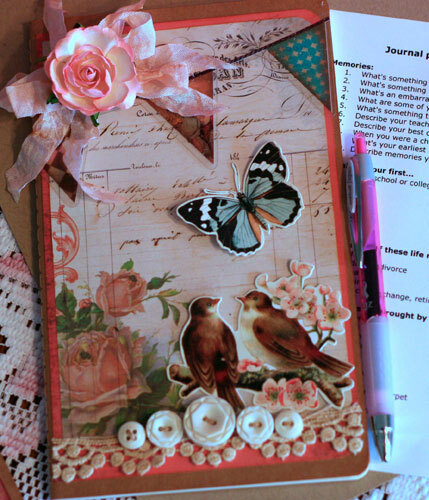 It took no time at all to decorate the notebook and now I have a special gift for that dear friend who needs encouragement or just a little gift to brighten her day!! I added a pen, bookmark, and a list of journal prompts to complete the ensemble and before I give it away, I will tie the entire package with a bow. I liked the project so much I decided to use a card I made with Glitz Design Goodies as the inspiration for another altered journal. The Glitz Design Afternoon Muse Paper Layer I used is my favorite design by Glitz! Sigh...I may have to buy more of these Paper Layers for sure!!! I hope this idea inspires you to make up some gifts to give to those who are special in your life!! Nothing makes my heart happier than giving a homemade gift to a friend!! Beautiful, beautiful ! Love both of these so full of prettiness and whimsey.